Microsoft-loving blog, Thurrott, have dug up some details on what is expected to be the new version of the Xbox Elite Controller. They’ve apparently ditched the AAs and introduced USB-C too. The previous Elite edition is sitting pretty at the top of our pick of the best PC controllers. The Xbox Elite controller has been our top pick for high-end PC controllers since we got our mitts on it. This controller doesn’t come cheap at nearly $125 / £169, but you get an exceptionally well-built, luxurious, and feature packed controller. The price is known to drop considerably, too. The initial launch of this controller was surprisingly successful despite its price, but once you get your hands on the weighty pad, you understand the price tag somewhat more. The details they’re reporting on first surfaced via Baidu and suggest that the new controller is going to see a change to the wireless connection, with Bluetooth-support now being offered as with the most recent Xbox One controller update. We would expect that will be in addition to, and not instead of, the standard Xbox One wireless connection the previous controllers have used. 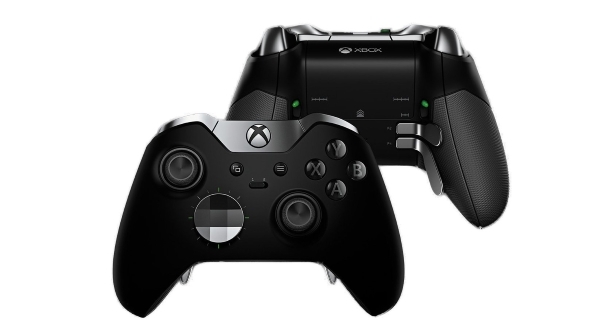 They’re also claiming the new Elite Controller will be rechargeable via a wired connection too, with the micro USB connection being replaced by the more powerful USB-C socket. But you won’t be recharging your AA batteries this time as it seems Microsoft are building in a battery into the chassis rather than offering the easy replacements. It’s also being suggested that the deluxe carry case that comes with the second-gen Elite Controller is going to double as its charging base too, so you’ll be able to keep the battery topped up when you pack it away for the night. Elsewhere Microsoft are expected to add a third profile option, three different levels of trigger locks, and longer travel for the paddle switches on the rear of the pad. There is also the suggestion on the Baidu post that Microsoft will also be providing the option to vary the resistance of the thumbsticks. That will come in handy for different games where the finegrain analog movement needs to be smooth. The exterior design seems mostly similar to the first generation model, if the blurry, leaked images are representative, although it wouldn’t surprise us if Microsoft pushed a white design this time. There’s no report as to when the new Elite Controller might be released, but the expectation is that we could well see it popping up at E3 in the summer. That said, the delayed new Xbox Wireless Adapter is being released at the end of January so we can hope against hope there’s some sort of parity there. Looks like the new controllers are coming thick and fast with the new big-boy Duke controller– the fat one from the original Xbox – getting a remake. That one’s popping up sometime in March of this year, like a really big appetiser.